As part of a national campaign, the five Sorrowful Mysteries of the Rosary will be recited for Faith, Life and Peace at 3pm next Sunday 7th October, in St Wilfrid's Church, York. 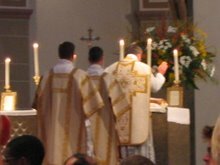 This sits nicely between the Sung Latin Mass Mass at noon, and Vespers at 6pm. So anyone wanting to combine a pious afternoon with a little sightseeing should find the occasion convenient. 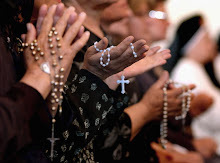 According to the website, Rosary on the Coast, the Sorrowful Mysteries will be recited simultaneously in a hundred or more locations throughout Britain. It follows a similar project some months ago, when the rosary was recited at a large number of coastal locations.